Introducing StarLily, the newest My Magical Unicorn to come out of the FurEver Forest! StarLily is a stunning young unicorn that is looking for a new home and a new friend. With a flutter of her wings and the lighting up of her nose, StarLily will react to your child’s voice or touch. ​With over 100 sounds and actions, there is a whole of fun to be had! StarLily is no kind of ordinary toy, she is a pet, and needs to be treated like one. From brushing her hair to flying through the sky, you never know what will happen with magical unicorns! The first thing most people notice about StarLily is her size. At roughly one and a half feet tall, StarLily is very large when compared to many toy pets of this kind. This is a welcome change. Toys of this style need to be sturdy and imposing for the child to be able to form a bond. StarLily’s large frame is excellent for this reason. It also means that her features, from her long legs to her sparkling wings and light up horn, all have a more dramatic impact. The build quality is exceptional here. StarLily’s fur is soft to the touch, and her limbs and joints all feel secure. She is also well balanced, which is particularly welcome when she has so many motions to go through. At no point does StarLily become unstable or unsteady, which is impressive for any kind of horse styled motion toy. The voice and touch responses are appropriately sensitive, and include some nice touches that you often don’t see in competitor toys. For example, StarLily comes with a plastic strawberry for eating. After she crunches on her strawberry, the colour of light up horn will change to signify that she is not hungry. StarLily is not a cheap toy, but it is difficult to argue she is overpriced. When you compare her to similar styled toys, you can’t ignore the fact that not only is StarLily far more responsive than most, she is very well build and is strikingly larger than the vast majority of these kinds of toy. 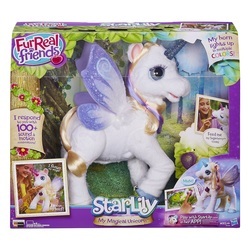 ​For many young children, and in particular young girls, StarLily will be a treasured pet.